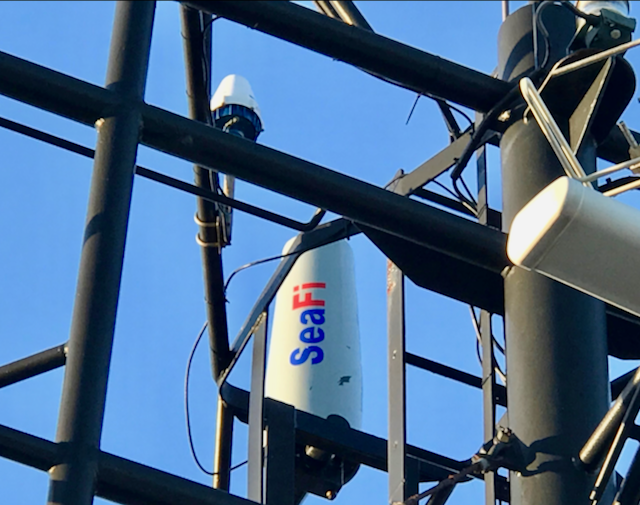 SeaFi is an alternative to satelite and celullar connectivity at sea. Taking advantage of the latest breakthrough in marine wireless data communications ships can be retrofitted with microwave technology to take advantage of broadband coastal communication up to 20 nautical miles from the coast. It makes it the ideal network infrastructure for port authorities, renewable energy, law enforcement, etc... For the past five years our company has contributed to the development of SeaFi an opensource approach to maritime wireless data communications based on consulting... Ships, buoy, wave energy converters equiped with SeaFi are part of what we call a Wireless Maritime Area Network. On June 6th 2018, a scientific experiment has been conducted by SEA-Tech under control from a group reputable witnesses composed of maritime professionnals, researchers and reporters. 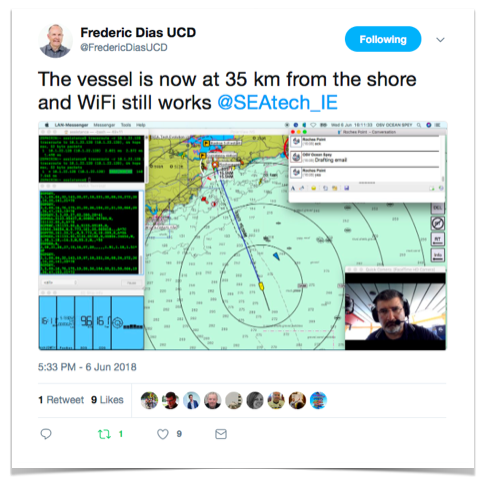 The purpose of the experiment was to set a world record for the furthest maritime broadband transmission without satellite or cellular network using SeaFi wireless maritime communication system. For several hours an Offshore Supply Vessel owned by Mainport, has set course south of Rochespoint lighthouse in Cork harbour (Ireland). Both the light house and the ship had been previously equipped with SeaFi (TM) transmission stations. SeaFi facilitates the creation of private networks in ports and coastal areas by establishing connection between lighthouses, maritime wind turbines, or offshore drilling platforms and vessels at sea. These networks are used to connect the ships and their crews, as well as the data collection buoys (weather, tides...) for example. SeaFI is a radio system on the frequency of 2.4 GigaHertz which works a little like Marconi's telegraph system, using coastal stations (connection points) and embarked stations at sea. After concertation and analysing of the data produced by each station, the independent witnesses have come to the following conclusion. The statements from Professor Dias and an Irish Naval Service vessel patrolling in range of OSV Ocean Spey were the first accurate statements to be reported. Within a couple of minutes from the last point of transmission Prof Dias and Lt Crd Brett, commanding officer of LÉ James Joyce, statements have confirmed indepently from each other a distance of 19 nautical miles. Supporting evicence from all the other witnesses involved on share and at sea, have confirtmed the above statements. 16:32hrs Prof Frederic Dias last calculations, in Rochespont lighthouse revealed that the ship was at a distance of 35 km from the lighthouse at this point in time. 16:34hrs Lt Cdr Martin Brett emailed to acknowledge reception reporting a position of Lat 51 30.05N Long 008 03.70W at 19.4 nautical miles from Rochespoint (35.9 kilometres) - This email would be received later the same day by the operator as OSV Ocean Spey would re-enter the SeaFi Horizon network after she had completed her duties offshore. This project was made possible by a group over fourty people who contributed from a few critical minutes to several weeks of difficult intensive work under the leadership of Arnaud Disant. Sinead Furlong our coordinator, Roddy O’Connor and SeaFi coastal station operator Théophile Buyssens have spent countless hours in Rochespoint. Steve Hogan from Port of Cork has built a unique knowledge of SeaFi stations after working with SEA-Tech on MV Denis Murphy and MT Gerry O’Sullivan since 2013... Robin Therond, Raphael Paulello, Jean-Christophe Faivre who contributed as part of SEA-Tech internship program. CIL Lighthouse keeper James Power who have shared his experience since he first welcomed SEA-Tech to Rochespoint in 2012. Mainport support was instrumental, Fleet Director Capt. Dermot Curtin, Superintendent Capt. Damien O’Sullivan and Capt. Dave Smith have been supporting the idea of a world record since inception. Vincent Gallagher technical manager in Mainport helped us retrofitting a SeaFi station on board Ocean Spey. Our witnesses at sea: Captain Mark Sloan and Chief Officer James Darwin, and the crew on board for their kind encouragements, a smile, an eye contact, a cup of coffee, a meal in the mess, it’s all part of a record. We have also received sponsorship from The Commissioners of Irish Lights since 2013, Rochespoint has been used for SeaFi research. Rittal, Quark-Elec and Polar Navy has provided invaluable tools. Special thanks to Gene Antsilevich in Polar Navy for working with us over weekend from the US to support SEA-Tech. Prof Frederic Dias (Mathematician UCD - ENS) witnessing the operations in Rochespoint lighthouse, calculating distance in realtime between stations. Lt Cdr Martin Brett (Commanding Officer LÉ James Joyce) confirming compatibility with satellite systems at sea and plotting last transmitting position. Dr Sean McSweeney & Sean O’Callahan (CIT) inspecting Rochespoint lighthouse SeaFi coastal station. Dave McDonald Nova Broadband Internet Service Provider, confirming terrestrial connection to Internet. World records are addicting… We will be improving this record soon hopefully!